Pavement fatigue refers to progressive damage from continued exposure to heavy loads and traffic. 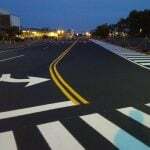 Similar to other materials, while asphalt does bend, continued bending and stressing will eventually “break” it, and you may begin to notice extreme wear in the particular area of stress. As pavement bends, its various layers are affected, and you may first begin to notice surface cracking. 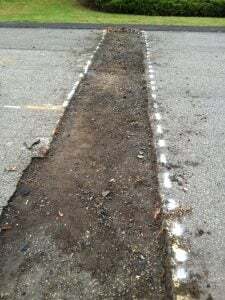 This can lead to moisture entering the base of the asphalt. If moisture continues to penetrate the base, fatigue will increase, and ultimately lead to failure. This is why crack filling is so important. Filling your surface cracks with hot rubberized asphalt mix allows for a seal at the surface and stops water from penetrating the base. Rubberized crack filler is also flexible, which helps your pavement to adjust better in all weather conditions. When we talk about loads and traffic effecting asphalt, there are several detailed aspects to consider. Contact pressure – Tire pressure plays a large role in determining a vehicle’s contact pressure on pavement. Increases in wheel loads and tire inflation pressures can contribute to increased pavement fatigue. With lower tire pressure, vertical stresses to the black top are significantly lowered and could help to prevent rapid pavement failure. Because of the impact tire pressure has on asphalt, pressure control systems are often used on heavy vehicles. Wheel Load – If your pavement surface is experiencing heavy traffic from large commercial vehicles, this means it will likely be continuously hit by the load of dual rear wheels. By considering the expected amount and type of traffic your surface will see, you can determine the necessary depth required to ensure the subgrade soil does not fail under the calculated stress. Speed – Contrary to what you may have assumed, damage is actually much higher when a load carrying vehicle is moving at a very slow speed. Axle Configuration – The more axels a vehicle has, the more it will affect your pavement. Increased axles can cause pore water pressure in the road structure to rise. Weaker subgrades are not as flexible, which means that with a longer vehicle, weak areas do not have enough time to recover before the next axle hits, contributing to further weakening and deterioration of the subgrade. The above effects are all intensified during the harsh winter months when temperatures are seeing major fluctuations and causing freezing and thawing. A good base increases the overall strength of a road. Any weakening of this base, which will likely be caused by moisture exposure of the effects of the freeze-thaw process, can greatly decrease your pavement’s lifespan. Thicker pavements will likely suffer less stress and last longer under heavy loads. By proactively maintaining your asphalt, you can increase the longevity of your pavement and ensure that its base is protected. Crack filling is so important, and luckily it is also extremely cost effective and easy. 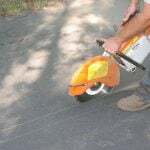 By filling surface cracks on your pavement, you are stopping moisture from penetrating the base of your pavement. If your base remains strong, your pavement will too. 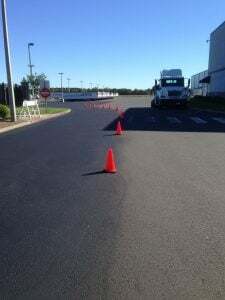 Wear-and-tear in inevitable, especially in high traffic areas, but maintaining your asphalt regularly goes a long way in preventing premature deterioration. 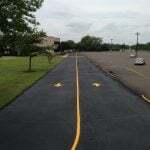 Making sure that your pavement is installed correctly and accurately based on traffic calculations, atmospheric conditions, etc., is the first step in ensuring it will last as long as it should. If your asphalt is installed incorrectly, your pavement will show fatigue and deterioration much sooner than it should. 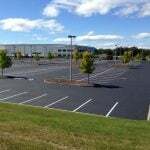 If you are looking for an experienced team of commercial pavers, EastCoat Pavement Services is the right crew for the job. We can help to calculate the proper thickness of your new pavement, construct an efficient and strong base, and ensure proper draining, all of which will lead to a longer lasting asphalt. Contact us today for your free consultation!